Mt Everest Expedition is becoming one of the enthusiastic point for everyone due to its unique adventure and highest mountain on Earth. People always proud to submit the Mt. Everest because of it’s charming to the people. Submitting Mt Everest is very challenging and it provides real life practice of adventure. Its charming has become very high in the recent days. Each year more than 10,000 people want to submit the Mt. Everest to take name in the society and earn self-satisfaction. Here are some reasons that Mt. Everest has become that mush popular for everyone. At the beginning of the 20th century, the British participated in contests to be the first to reach the North and South Poles, without success. A desire to restore national prestige led to scrutiny and discussion of the possibility of "conquering the third pole" – making the first ascent of the highest mountain on Earth. 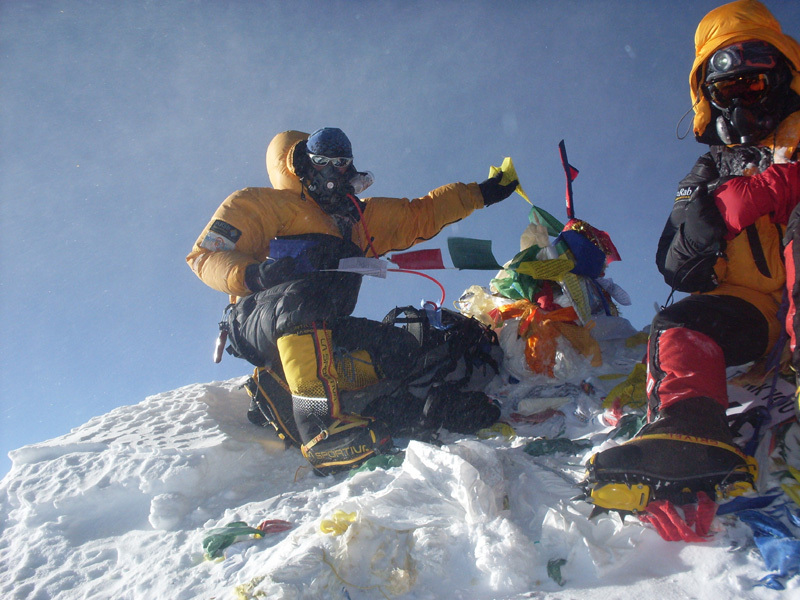 Mt Everest climbing has proved to be a benchmark of climbing achievement. The mountain receives around 1000 summit attempts every year. Everest can be climbed both from the southern side Nepal and northern side Tibet as per the interest of submitter. After the Cultural Revolution in the 1950s, China closed the Tibet borders to outsiders and Nepal began welcoming foreigners to the Everest Region. Since then the southern approach to the mountain via the Khumbu Valley became popular among the climbers. But now Tibet border has already opened and easy to assess. Mt. Everest was first summitted in 1953 by Tenzing Norgay Sherpa and Edmund Hillary via the South Col. Climbing Mt. Everest is certainly a lifetime opportunity. However, Everest expeditions encounter many seen and unseen obstacles including high altitude, harsh weather conditions and even sheer exhaustion. Therefore, we strive hard to conduct the best expedition program putting high importance on the safety aspects of the climb with the experience sherpa’s and other three four time submitter. Here are some photos of Mt. Everest Submit which was successfully accomplished in April –May with Mt. Submitter Mr. Shiddi Tamang . Upon your arrival in the Kathmandu airport (KTM) you will be greeted by a representative from Nepal New Generation Trek and Adventure After completing your custom formalities (Visa, etc) pick up your luggage and look for our representative with a NNGTA display board at the arrival gate. You will be then transferred to your hotel. After check in, you will visit NNGTA office, meet your trekking guide as well as other participants and do final preparation for the trip. Later in the evening there will be a welcome dinner which will introduce you to the Nepalese food culture. We will return to the welcome haven of the Hotel. Once back in Kathmandu, NNGTA will host an evening barbecue to celebrate the expedition and as a farewell party to thank the Sherpas for their support and friendship. Your safety is of paramount concern while traveling with Nepal New Generation Trek and Adventure pvt ltd Please note that your leader has the authority to amend or cancel any part of the itinerary if it is deemed necessary due to safety concerns. Every effort will be made to keep to the above itinerary; however, since this adventure entails travelling in remote mountainous regions, we cannot guarantee that we will not deviate from it. Weather conditions, health condition of a group member, unexpected natural disasters, etc., can all contribute to changes in the itinerary. The leader will try to ensure that the trip runs according to plan, but please be prepared to be flexible if required. 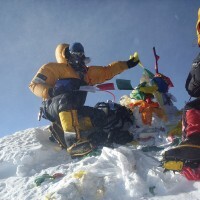 Mt Everest climbing has proved to be a benchmark of climbing achievement. The mountain receives around 1000 summit attempts every year. 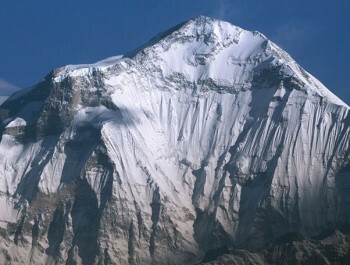 Everest can be climbed both from the southern side Nepal and northern side Tibet. After the Cultural Revolution in the 1950s, China closed the Tibet borders to outsiders and Nepal began welcoming foreigners to the Everest Region. 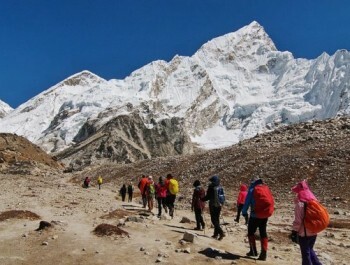 Since then the southern approach to the mountain via the Khumbu Valley became popular among the climbers. Mt. Everest was first summitted in 1953 by Tenzing Norgay Sherpa and Edmund Hillary via the South Col. Climbing Mt. Everest is certainly a lifetime opportunity. 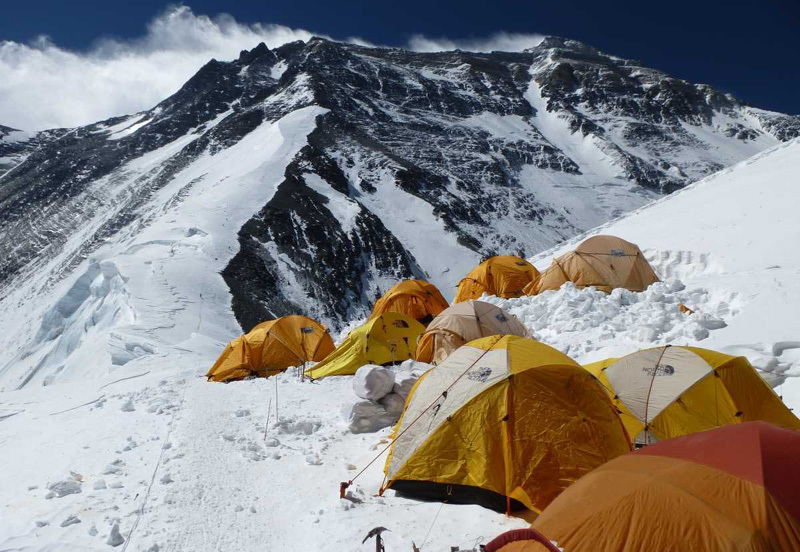 However, Everest expeditions encounter many seen and unseen obstacles including high altitude, harsh weather conditions and even sheer exhaustion. Therefore, we strive hard to conduct the best expedition program putting high importance on the safety aspects of the climb. Despite being the highest mountains on planet Earth, the Himalayan range of mountains including Mt. Everest are relatively younger than their American and European counterparts like the Andes, the Alps, and the Rockies. The Everest has fascinated the mountaineers all over the world since the European climbers discovered the Everest when Tibet was opened to outsiders in the 1920s. During his lecture tour to the U.S. in 1923, George Mallory gave the reason behind his interest in Everest Expeditions quipping, 'Because it's there'. Unfortunately, Mallory and Irvine disappeared high on the mountain in 1924 probably due to a snow storm similar to that documented by Jon Krakauer in his book Into the Thin Air. We believe that our planning, logistics, staffing and experience coupled with your enthusiasm, patience, and perseverance would help you achieve your lifetime dream. It is a condition upon joining any of Nepal New Generation Trek and Adventure trips that all clients be insured for comprehensive expenses that might incur due to medical issues or accidents (this includes air ambulance, helicopter rescue, and treatment costs). Please note that we don't arrange or sell insurance. We will be staying at Hotel Kathmandu View in Kathmandu, teahouses during trek and tents for climbing. All accommodations are on twin-shared basis. Our Everest expeditions are led by experienced and professional mountaineers and guides who have scaled the mountain several times supported by other crew members and all the necessary logistics for the expedition. Not only in terms of qualification, but we also make it sure that our leaders have proven track of record in climbing high altitude mountains. 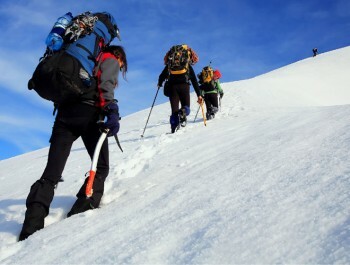 The number of guides is chosen according to the team size to maximize every individual climber’s chance of making it to the summit without compromising the safety aspect. Our expedition leaders are also equipped with the expertise in handling altitude related problems including acute mountain sickness (AMS) symptoms. 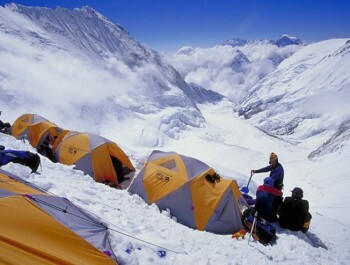 The crew members are experts in setting up tents and camps, melting snow on the route, cooking, and other daily needs. Trekking days also help the body to respond and acclimatize with the high altitude environment. It's always advisable to go slow in the beginning stopping at villages that sit increasingly higher in the range. We would trek a few miles and then rest for the night, letting the body reconfigure to the thinner air. In the remote countryside the? Early to bed and early to rise schedule proves most suitable. A typical trekking day starts at around 6 or 7 am. Enjoy the hearty breakfast and begin trekking. Carry your pack containing personal items you need for the day. The porters and yaks carry all the loads. Walk at your own pace, enjoy the scenery, chat with the natives, and take photographs. The lunch time depends upon the terrain and is prepared by our catering team. Generally you stop for lunch after about 3 hours of walking. The lunch hour also helps in acclimatization. The aim would be to reach next stop by the sunset. After reaching the overnight stay point, the crew members fix the tents. You may relax with a cup of tea or coffee or take a pleasure walk around the camp site. The dinner would be ready around 7 PM. Enjoy the dinner while sharing the day's experience with team members. The climbing itinerary may vary according to the climber's personal experience. A climbing day involves a steady climbing for 3-4 hours in the morning. After taking lunch, rest and relax, there is a climb of 2-3 hours in the afternoon. However, flexibility in climbing itinerary is necessary as people climb at own pace and respond individually to the stresses of climbing. 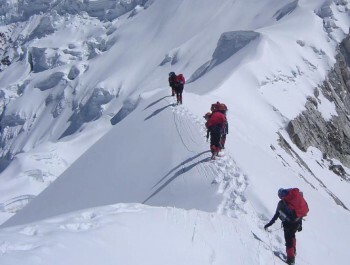 We ensure the ratio of climbers and Sherpa guides focusing on high safety measures so that each individual climber is able to progress at their own rate. The Base Camp of Mount Everest at 5,200 m (17,500 feet) on a glacial field lies higher than most of the tallest peaks in the Alps and the Andes. It's necessary to spend enough time at the Base Camp to allow your body for high altitude acclimatization. You must feel fully comfortable before embarking further from the Base Camp. You can ascend a smaller peak, Kala Patthar which gives the views of Mount Pumori and the stark black pyramid of Everest itself. There will be a puja at the Base Camp with the Buddhist chants, prayers, and incense and prayer flags for the successful passage. After the Base camp, we cross crevasses, sercs and ice black. Similarly we face large chunks of ice on the way up. The Sherpas fix the Khumbu Ice Fall with ropes and ladders. Use fixed ropes and aluminum ladders to climb ahead to camp 1 at 6400m. 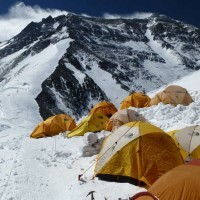 Camp 1 is situated at the top of the ice fall on a flat area of snow. 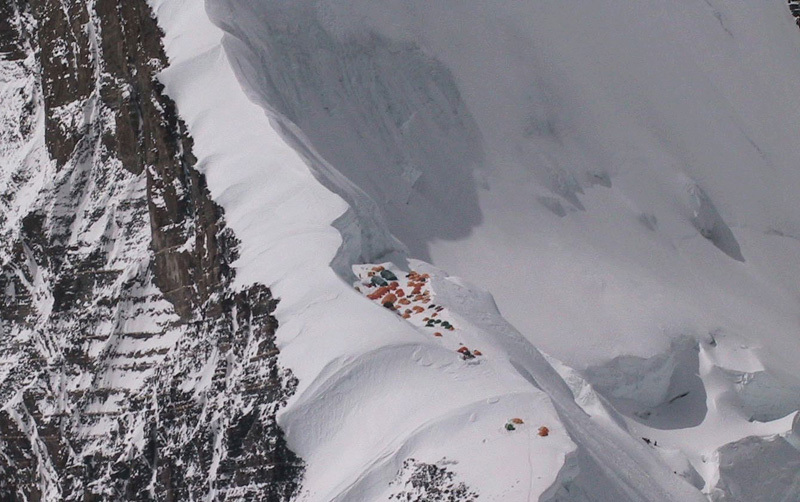 Camp 1 also functions as an intermediate camp until Camp 2 is established at 21,000ft in the Western Cwm. 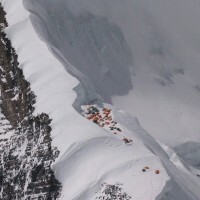 Camp 2 is located at the foot of the icy mount Lhotse wall. Weather is fine here mostly except for the clouds that roll in from the low range. There can also be violent wind. Camp II will be the base during the placements of Camp 3 and Camp 4. Hence, Camp 2 will consist of large tents for cooking and dining and several small tents for sleeping. 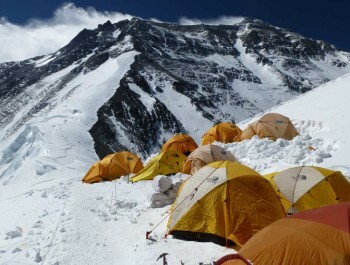 Camp 3 is located at the height of 22300ft, adjoining to mount Lhotse wall. Climb the Lhotse wall using fixed rope and leading to camp 4. Ascend the steep down-slopping rotten limestone. Cross short snowfield route that moves ahead to the east before finishing the flats of the south col. Keep oxygen supply handy. 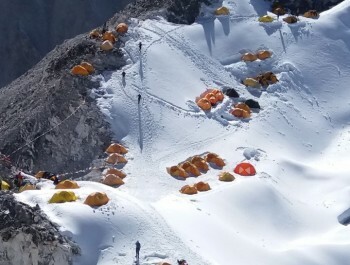 Oxygen will be used above Camp 3. Beyond camp 3, there may be some discomforts due to thinning air necessitating use of oxygen. Climbers need to go through the steep allow bands. Cross short snowfield, the route takes up the Geneva Spur to the east before finishing the flats of the south col. Camp 4, located height of 8,400m, is the last camp of the Expedition. The final and dangerous part of the climbing. Chances of encountering violent wind. The summit is about 500m from Camp 4. 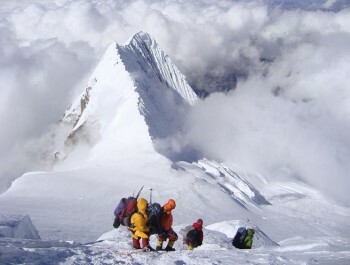 The normal best way to reach to summit is via the narrow South - East Ridge. 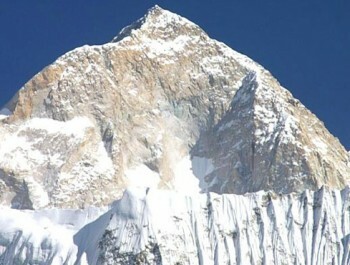 The springtime from March to May is considered the favorable weather for Everest climbing. However, the weather conditions in Everest are never fully predictable. Temperatures may get as low as minus 20C in summer, but can drop to minus 60C or even lower during winter. The possibility of bad weather such as snow, wind, and cloud should also be taken into account. Similarly, the wind speeds may rise to 80Km/h (50mph). At the Base camp the temperature is about 15C warmer than at the summit. The oxygen level around 7,000m is only 40% of what it is at the sea level. Although Everest is not as technical as K2 or Kanchenjunga, it’s simply not a piece of cakewalk to climb Everest even for the veteran mountaineers. It’s also true that getting back from the summit is more important than getting there. There is a real objective danger and judgmental error involved in every Everest Expedition. The oxygen level over 7,000m is only 40% of what it is at the sea level. The weather is never fully predictable. The climbers must have years of prior experience on rock and ice climbing especially above 7,000m. You also need to feel confident and comfortable ascending or descending on fixed ropes along a steep technical terrain. Moreover, as Jon Krakauer says, while you’re Into the Thin Air up there, “The consequences of a poorly tied knot, a stumble, a dislodged rock, or some other careless deed are as likely to be felt by the perpetrator's colleagues as the perpetrator.” Your actions affect not only your own, but welfare of the entire team. Bandanas (2). Used to shade your neck. Expedition Backpack. 3,500 - 4,000 cu. In. Sleeping Bag. (Expedition quality rated to at least -20°F). Self Inflating pads (2). Two 3/4 or full length pads. Make sure to include a repair kit. Sunscreen. SPF 40 or better. Lipscreen. SPF 20 or better. Camp Knife or Multi Tool. Climbing helmet. Alpine climbing helmet with sizing adjustments. Prussiks. Or bring 40 feet of flexible 6mm acessory cord to make into prussiks. Heavyweight Synthetic/Soft Shell gloves. 1 pair. Expedition Shell Gloves w/ insulated removable liners. 1 pair. Hand warmers and Toe Warmers: Bring 3 sets of each. Double Plastic Climbing Boots w/ altitude liners. Good quality plastic shells with inner boots. Avoid tight fit with heavy socks. Fully Insulated Overboots. Not needed with Millet Everest or Olympus Mons Boots. Gaiters. Not needed with One Sports or Olympus Mons. Wool or Synthetic Socks. 4 pair heavyweight wool or synthetic socks (wool is warmer) to be worn over the liner socks. Vapor barrier socks. Optional. Helps reduce moisture buildup in your boots, also keeps your feet a little warmer. Lightweight Long Underwear. 2-3 pair tops & bottoms. Insulated Synthetic Pants. Full separating side zippers. Expedition Down Parka. Fully Baffled, Expedition Weight. The list we’ve provided is only a guideline. Everything mentioned here is required. It’s your choice regarding the brand. However we suggest you to purchase from best brands available so that it makes your climb safe and comfortable.